AirDroid 3 is ready for beta testing, finally! And we understand you’ve been waiting for this for some time already. So here it is, for you ONLY. The following is a simple guide for you to start the testing, we would like to let you know that every single feedback is highly appreciated and will be handled with caution. 2. Sign in to the same AirDroid account on your device(s). Done. You can beta test AirDroid 3 now. Please be well noted that this is a closed beta package, so please expect some edges and possibly some stability issues from time to time. Our engineers are working extremely hard polishing AirDroid 3 as much as possible before releasing it publicly. If your antivirus report AirDroid desktop client as having a virus, please don’t worry. This should be a false report, just ignore it. Because this is a beta version and we haven’t sent to any antivirus to detect it. We will do virus detection before releasing AirDroid 3 officially. – Control Android from computer remotely, like Remote Desktop or VNC. – Launch an Android app remotely from it’s notification. – In the first version, AirMirror will work out of the box in a few pre-certified phones, but most phones will need to get rooted. AirDroid is working with major OEMs to make AirMirror work without rooting on more devices. End-to-End encryption for all SMS, app notifications, contact data, account credentials and other sensitive data. E2EE makes it practically impossible for any 3rd party, including the government and the developer, to access the user data transferred via E2EE. It’s our commitment and priority to make AirDroid safer. – Transfer files from computer to Android, Android to computer, Android to Android, on local connection or remote connection. – Transfer file folder from computer to Android. – Files transferred by remote connection will be available for download for 7 days, and then will be permanently deleted from cloud. – Receive and reply to SMS on computer. – Real-time notification of incoming calls. – Reject incoming calls, optionally with a canned quick response by SMS. – Accept incoming calls. Call talking is still on the phone, not on computer. – View contacts and send SMS from contact list. – Get real-time alert of phone notifications from any apps. – Silence individual or all app notifications. The Android interface is redesigned to make it more intuitive, and also feels more “Android”, less iOS. The update for AirDroid Web is mostly about bug fixes and stability improvements. 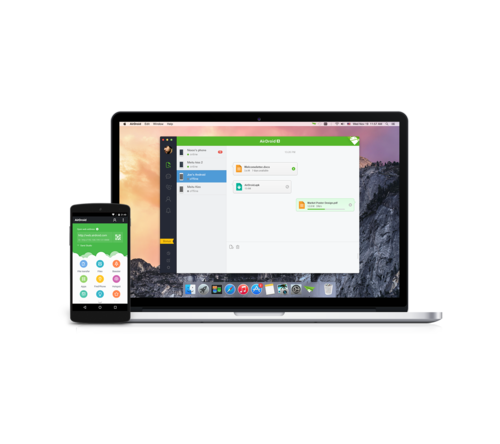 AirDroid Web is still as important as Windows and Mac, and we’ll continue to invest heavily on it, but in AirDroid 3, we put more resources in creating the all new desktop clients. › AirDroid 3 Is Officially Released! Is their a list of certified devices that can run Air Mirror without root?